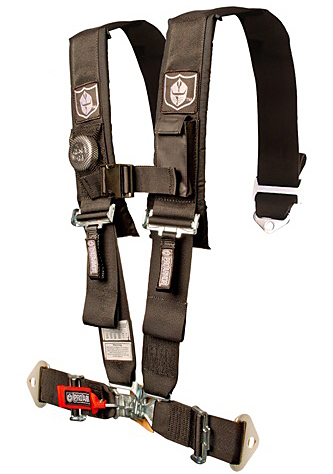 The Pro Armor 5 Point SFI Approved Harness in Black. This 3" harness is different than the normal harnesses in that it is not sewn which makes it SFI approved. SFI (Motorsports Safety Organization) approval means you can use these in sanctioned racing events this means that the lap belt is separate from shoulders straps. Each harness comes with a water resistant phone pocket on one side and a mesh light pocket with included flashlight on the other. Straps are held together with an adjustable sternum strap. Lap belt comes with leather patch on the quick release buckle so there is no pinching. Easy installation using existing factory seat belt mounting points and hardware.